Usually start training sessions with my pupils with preparatory work on a circle. I find it difficult to get horses to evolve on a straight line. The circle “helps the horse” because it facilitates work without imposing excessive constraints. To slow down a horse that rushes its paces, it is for example pointless to interfere with its mouth; it will be sufficient to simply shorten the circle. 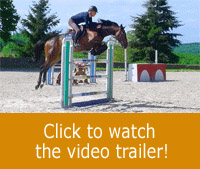 Generally speaking, working on a small circle allows one to “collect” the horse and regain control in good conditions. This of course does not exclude varying one’s work. The aim is to improve the engagement of its hindquarters, to obtain a lowering of the haunches, a bending of the spine, supple shoulders and abdominal and upper line muscles. 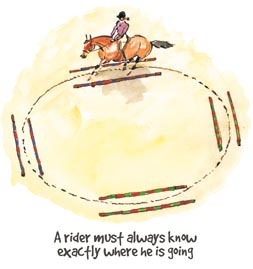 JI usually start by drawing on the ground a first circle with a diameter of 15 metres and a second slightly larger one forming a circular corridor (1 metre wide) within which the rider is allowed to ride. You can also create this corridor placing poles on the ground. The rider must at all times have a clear idea of where he is going. If there isn’t a real circle on the ground, you must decide with precision the track on which you will ride. In your mind, this could be a plate or any other circular object. The horse must bend to follow the circle’s curve. The horse’s spine duly bends without exaggeration. You will be able to see part of the horse’s inside eye. Be concentrated, ride “as if” there were walls forming a corridor within which you must remain; above all, think about maintaining your basic position, the one previously mentioned: “the centred position”. If the horse goes towards the exterior of the corridor, this is no doubt caused by the weight of your body. In this case, look outwards to re-establish your balance in the centre, on all four the horse’s legs. Be uncompromising if the horse does not stay on the track. 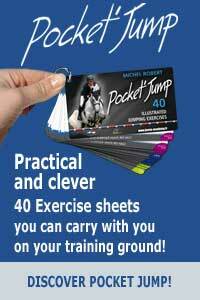 Naturally, this exercise is carried out at all three gaits, including transitions, and following the planned route. The aim for the rider, when riding on a circle, is to be ready “for anything”. This means leaving no doors open that would allow the horse to avoid the exercise. The only thing that it is allowed is to move at the pace and in the direction requested. Extract of the book "Secrets and method of a great champion"